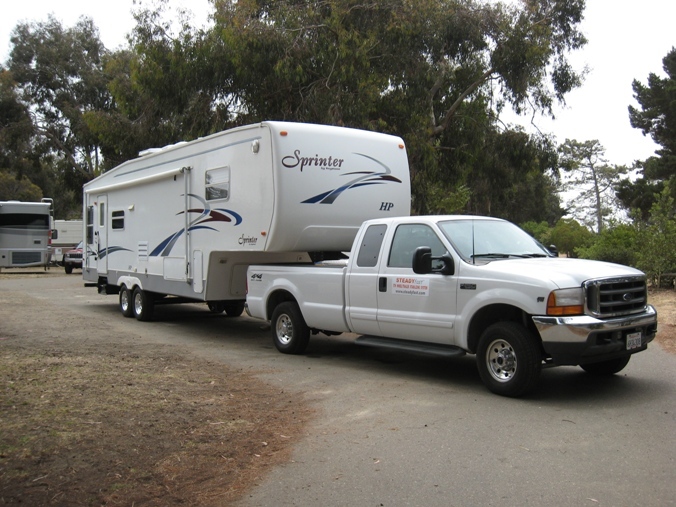 The STEADYfast® Trailer Stabilizing System is designed to give the best possible movement reduction of a parked Fifth Wheel or Travel Trailer and at the same time provide the most convenient and easiest setup. It will significantly reduce the shake, wiggle, and bounce movement, out performing any similarly functioning equipment on the market today. 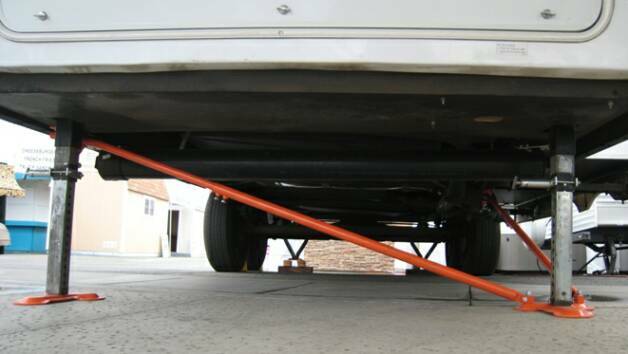 No expensive "Between Wheel" Chocks are needed with this system! 2. May be used with the tow vehicle hitched or unhitched. 3. 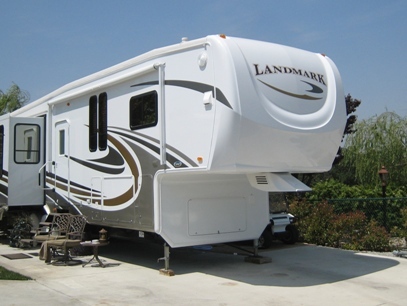 Extends and retracts with leveling jacks. 5. Three conveniently located locking handles. 6. Compression pivots restrict movement of braces in both directions. 7. Two large profile, self-leveling foot plates for firm footing on hard and soft ground. 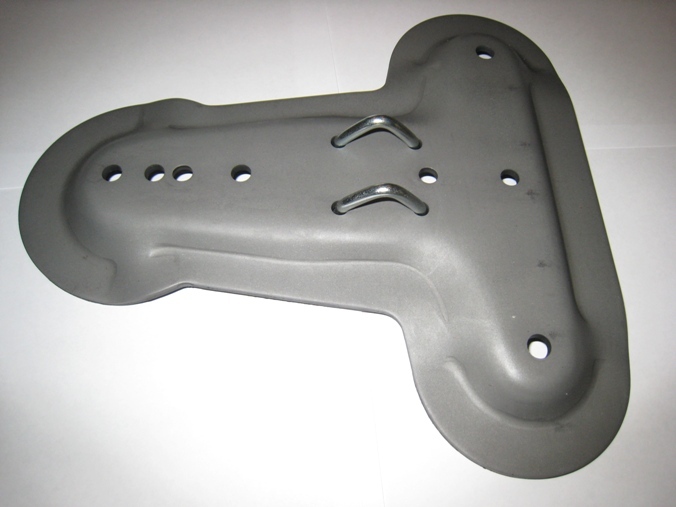 Additional foot plates may be purchased for jacks not used for stabilizing braces. 8. 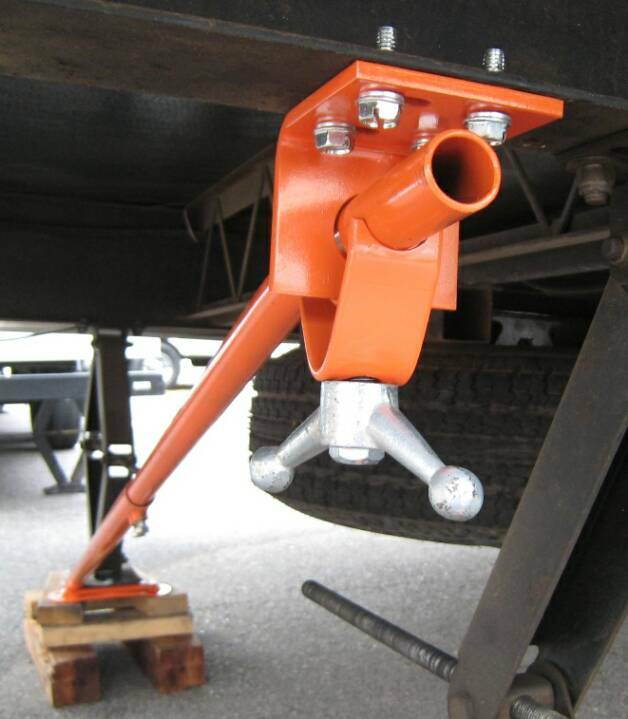 Mounts between side frame and jack base plates, allowing the STEADYfast® trailer stabilizing system to be installed at the best location to stabilize your trailer without installing additional supports. Installation entails drilling a maximum of fourteen holes for 5/16” bolts and bolting the components together. Installation should take less than 3 hours. It may also be welded to trailer frame. 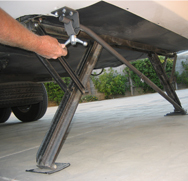 This fifth wheel stabilizer and camper trailer stabilizer is a very simple and practical system to install if your travel trailer or fifth wheel shaking, wiggle, and bounce movement annoys you. 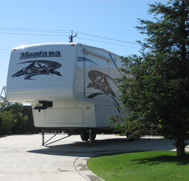 We believe you will find this to be the Best RV Stabilizer. 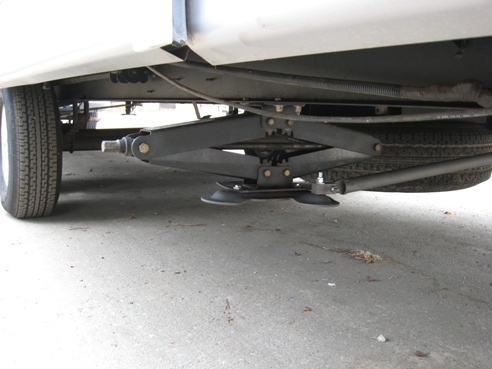 It works Much Better than a fifth wheel king pin stabilizer or tripod and easier to use. 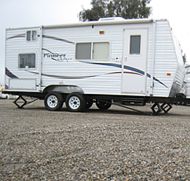 "The rv is very stable and I am very pleased with the results." 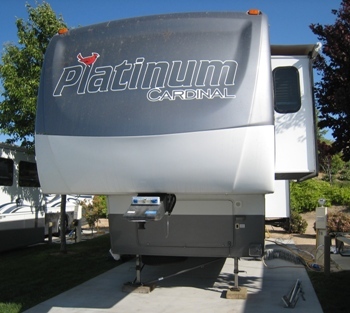 "Actually this system should be factory installed on all trailers pull or fifth wheel right from the factory." 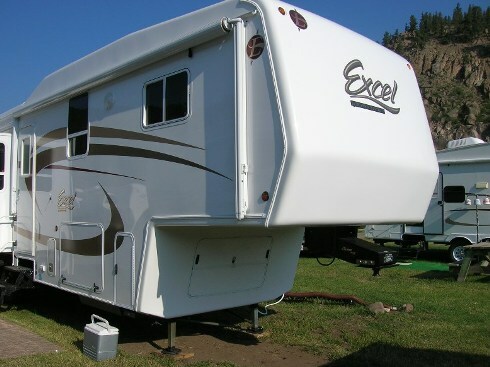 How much movement will the system remove from my trailer? 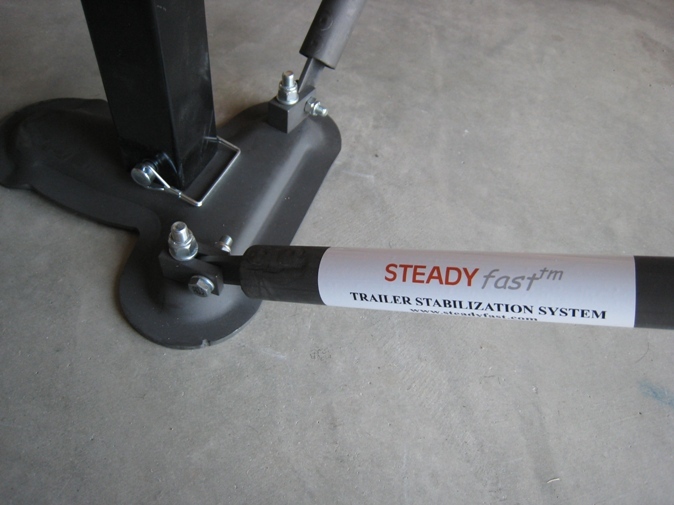 Will the STEADYfast® Stabilizer fit on my trailer? 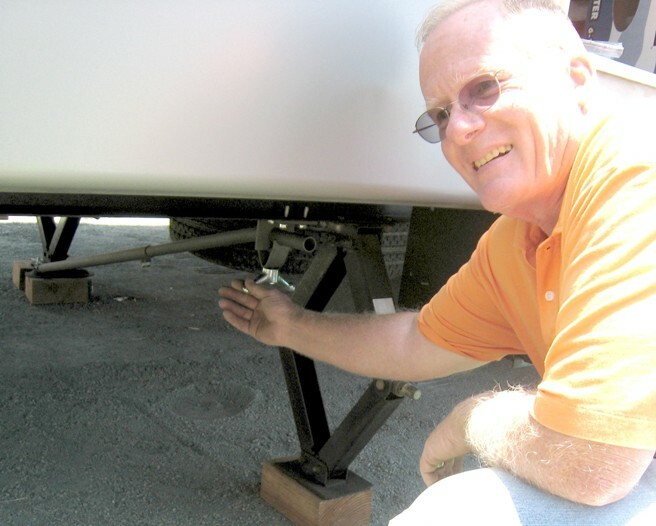 Can I install the STEADYfast® Stabilizer myself? What Advantages does the STEADYfast® Stabilizer System have over a tripod system? 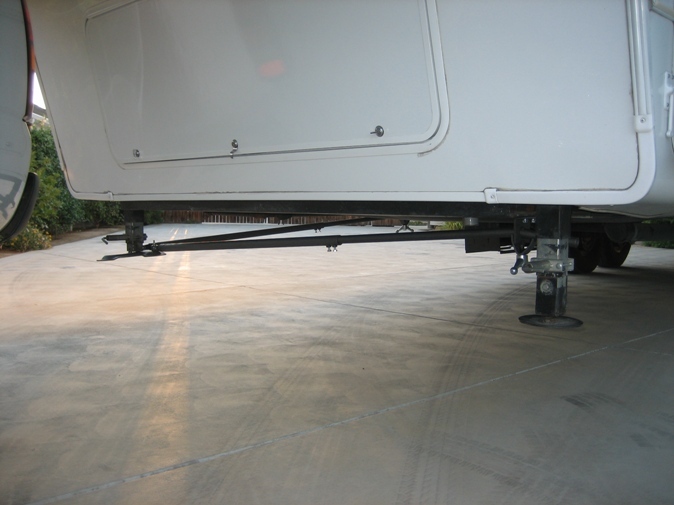 RV Stabilizer Installed on the trailers below and many more! 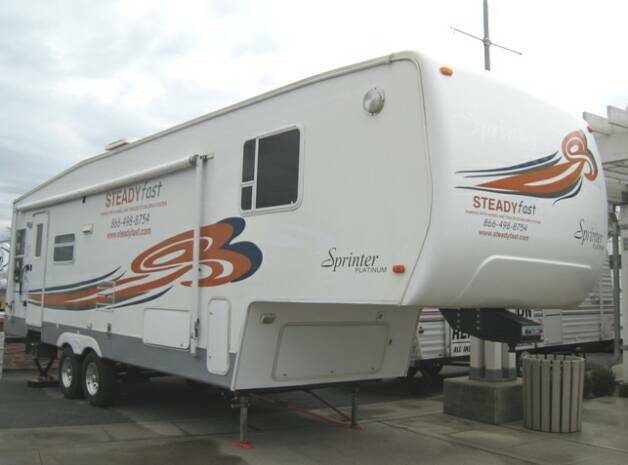 The STEADYfast® 2003 Keystone Sprinter on display at the 2009 Sportsmans, Boat, RV and Ourdoor Living Show in Bakersfield California. This front angle view shows the two front braces attached to the STEADYfast® foot plate. The no-play braces extend to the frame where they are held in place by the locking clamps. 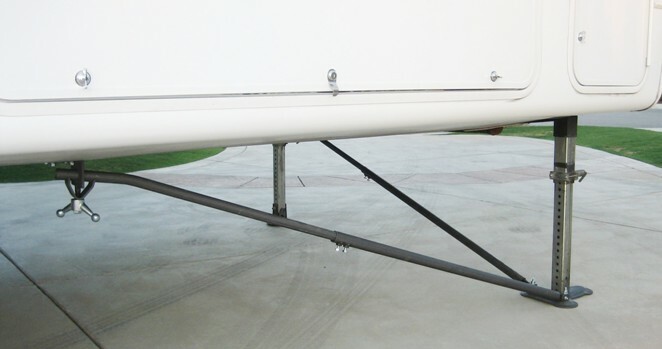 This straight on front view shows how one of the braces with no joint play can anchor the frame of the trailer to the ground to stop the frame from moving. The brace both pushes and pulls on the frame so no additional brace is needed. 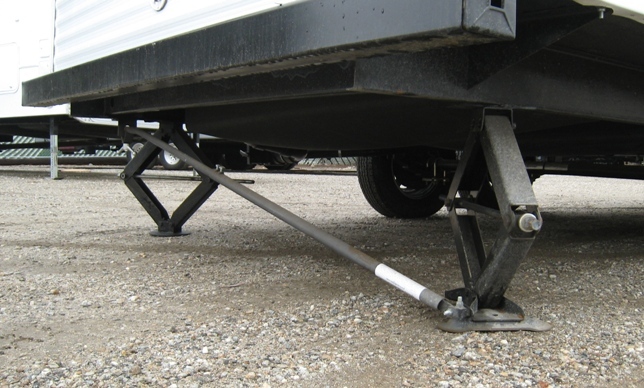 The STEADYfast® three padded foot plate self levels and allows each brace to be anchored directly to the ground. There is no need to be concerned about wiggle or play from factory components. The site had a steep slope causing the rear to be about 30 inches off the ground. With the proper use of blocks the the trailer is just as solid. 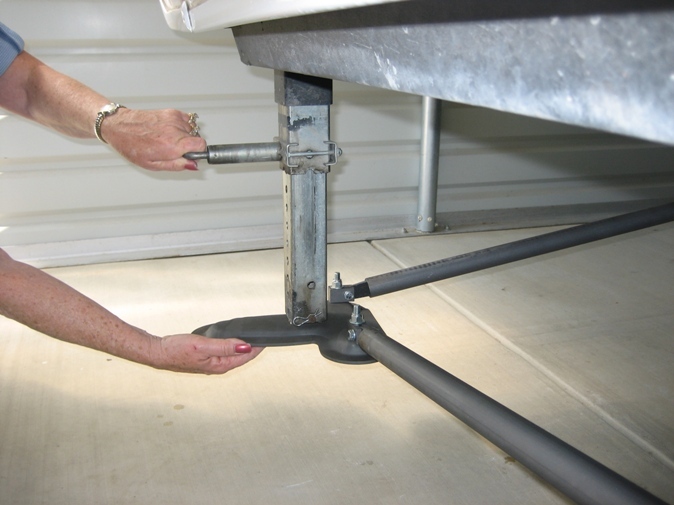 The bolts near the the center of the brace are only used to adjust the brace length for the specific trailer during installation. 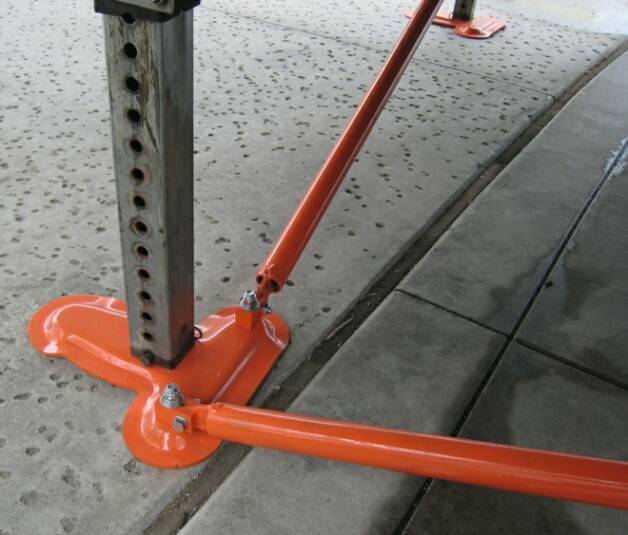 The locking clamps are the only components that are used during set up or tear out. They are always mounted on the frame so they are easy to reach. Just tighten or loosen them during set up or tear out.